Sherlyn gets shocked knowing her mum has called Police thinking thief is inside the house. Shrishti misunderstands Sherlyn’s mum is having an affair and tells Preeta and Karan. She tells that they shall check slam book and leave. Karan finds the Slam book on Sherlyn’s bed and determines to expose Sherlyn and Prithvi. Rakhi calls Preeta and informs that Karan and Shrishti are also not in the party. Preeta says they are altogether. They try to open the book, and search the keys. Sherlyn rejoices seeing Akshay torturing Kritika. Mahesh’s Chachi dislikes Sherlyn. Sherlyn gets upset. Rishabh notices Prithvi and Sherlyn smiling looking at each other. Prithvi signs Sherlyn that Rishabh is looking at them. He doubts something is fishy. Karan and Preeta have some romantic moments in Sherlyn’s room. Karan feels love for her and looks at her. Shrishti notices Karan and Preeta’s love on the cards. They head back home. Karan tells Shrishti that he has no interest on marriage else he would have married Preeta long back and end Prithvi’s chapter. Preeta says she will not marry anyone just like that. Shrishti teases them. 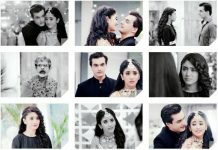 Karan, Preeta and Shrishti come back to the party and exposes Sherlyn and Prithvi’s affair using their romantic picture and Sherlyn’s Slam Book in which she has written about their affair. Sherlyn and Prithvi get a huge shock. Preeta couldn’t believe that they have planned revenge on Rishabh and her. Karan and Preeta’s dreams of a love union gets a hope. Preeta would be realizing her love for Karan.